Rare images of Louis Riel and Manitoba in the 1860s and 1870s turned up recently at an Australian auction of memorabilia from the American civil war. The eight photos are "cartes de visite," a type of small photograph popular during the period and are now on display at the University of Manitoba. 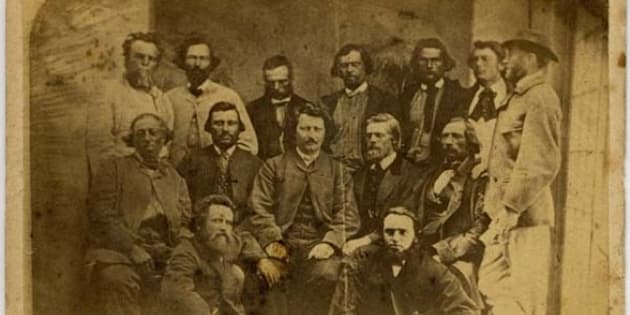 One of photos shows a famous scene of Riel and his councillors. The print is likely the first made of the original photograph, according to U of M.
The other images give a fascinating look at what life was like in Manitoba during the time of Riel's rebellion. One shows a man dressed as a Metis hunter, another First Nations mourners hiding their faces from the photographer. You can see all the images in the slideshow below and learn more about them at U of M's website.